Yuki Yanagita homered and drove in four runs Saturday in Tokyo to lead Japan to a 12-6 win over the MLB All-Stars and a 2-0 lead in the six-game exhibition series. Yuki Yanagita homered and drove in four runs Saturday to lead Japan to a 12-6 win over the MLB All-Stars and a 2-0 lead in the six-game exhibition series. Yanagita, who hit a game-ending two-run homer in Friday's 7-6 win, singled in a run in the first inning at Tokyo Dome and hit a two-run homer in the third to give his team a 5-0 lead. "The entire lineup was able to string together hits," said Japan manager Atsunori Inaba. "I think we are on the right track now and I would like to see us continue to do the same in the game tomorrow." Yanagita singled in another run in the fifth when Japan scored four more runs to take a 9-0 lead. Shogo Akiyama also had a big night at the plate, going 3-for-4 with three runs batted in. "I thought tonight's game actually turned early," Don Mattingly, who manages the Miami Marlins, said. "They were able to score early. We came out and got first and third and couldn't score early and we lost momentum right there." National League rookie of the year finalist Juan Soto got the MLB All-Stars on the board in the fifth, hitting a homer down the left-field line for the second straight game. Enrique Hernandez and Kevin Pillar drove in runs in the seventh and J. T. Realmuto hit a three-run homer in the eighth inning. Pillar said the MLB squad is not taking the two losses lightly. 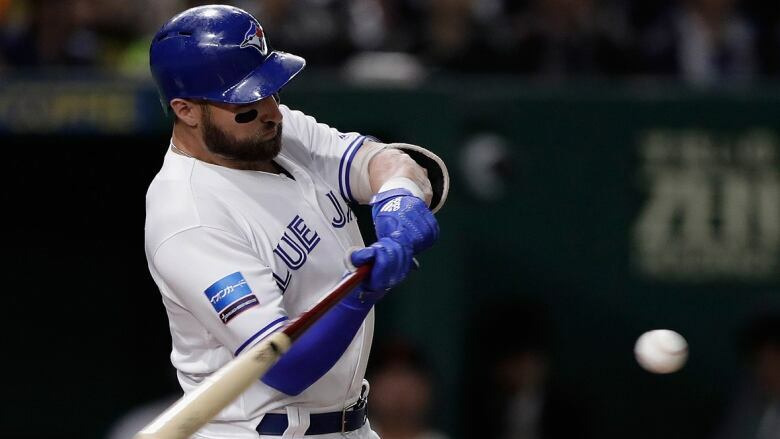 "Athletes and competitors, we don't know any other way," Pillar said. "We are going to go out there and compete. We are not going to allow these two games to dictate the series." Japan starter Naoyuki Uwasawa picked up the win after striking out seven and giving up one run on four hits over five innings. MLB starter Erasmo Ramirez took the loss, giving up five runs on six hits over three innings. The series continues Sunday with another game in Tokyo, followed by one game in Hiroshima on Tuesday and two games in Nagoya on Wednesday and Thursday.